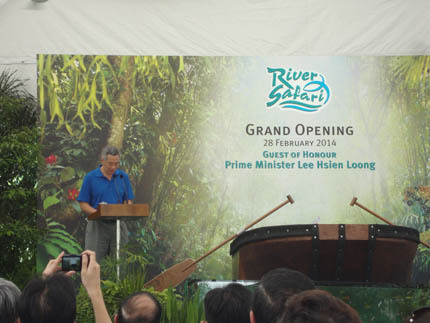 Prime Minister Lee Hsien Loong and Wildlife Reserves Singapore chairman Ms Claire Chiang at River Safari's grand opening. 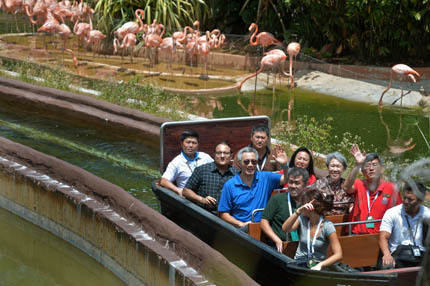 SINGAPORE - Since its soft opening in April last year, the River Safari has received more than 1.1 million visitors from all over the world, said Ms Claire Chiang, Chairman of Wildlife Reserves Singapore (WRS). 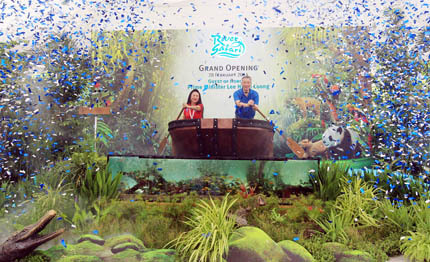 "The park has been well-received since we opened the Giant Panda Forest in Nov 2012," said Ms Chiang at the grand opening of River Safari this morning. She added that this shows that visitors are "curious" about the world of river habitats. The 12-ha park, which is located at Mandai, offers visitors a wildlife adventure inspired by the world's most iconic rivers, including the Amazon, Ganges, Mekong, Nile and Yangtze rivers. 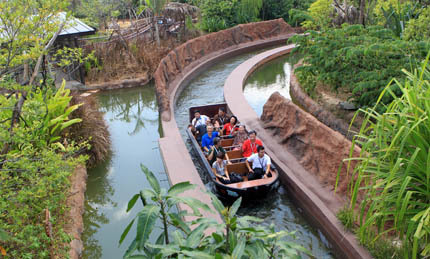 The park is Asia's first and only river-themed wildlife park. 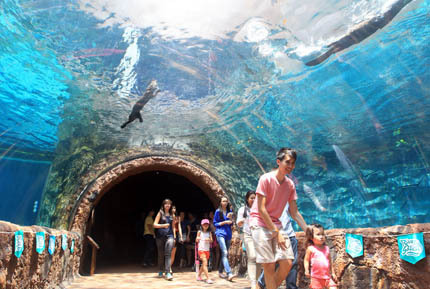 Built at a cost of $160 million, River Safari houses 6,000 animal specimens, such as the giant river otter and resident giant pandas, Kai Kai and Jia Jia. 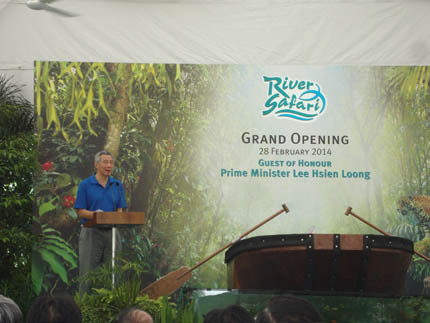 Prime Minister Lee Hsien Loong officiated the park's grand opening on Friday before 300 guests. 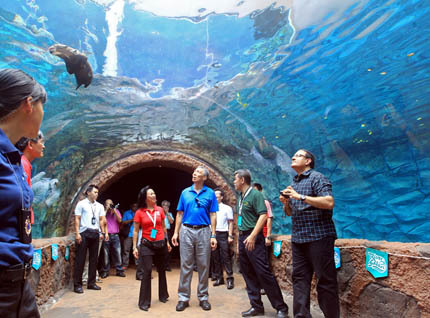 In a speech, he said that Singapore needs to enhance its tourism sector to continually refresh its attractions and events. Mr Lee said that travellers are becoming increasingly spoilt for choice, and companies must provide more interesting and varied options to meet the needs of more discerning travellers. "Workers must deliver higher quality service to meet higher expectations," he added. To stay on top of the game, Ms Chiang said that WRS will enhance the service skill set of its staff so that they can offer visitors better hospitality. WRS is also looking to add more species of wildlife to enhance their collection, said Ms Chiang. The park is also hoping for an addition to resident giant pandas Kai Kai and Jia Jia's family. "We are all waiting anxiously and we are hoping for good news maybe in the next two years," said Ms Chiang. 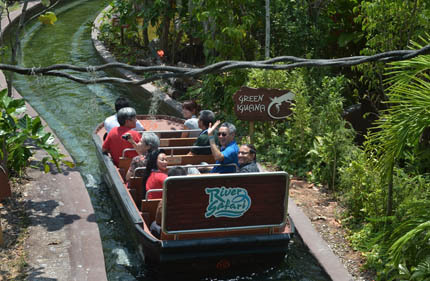 River Safari opens daily from 9am to 6pm. Tickets are priced at $25 (adult), $16 (child between 3 to 12 years) and $12 (local senior citizens age 60 years and above). From March 5, 2014, tickets to the Amazon River Quest boat ride will be priced at $5 (adult) and $3 (child). 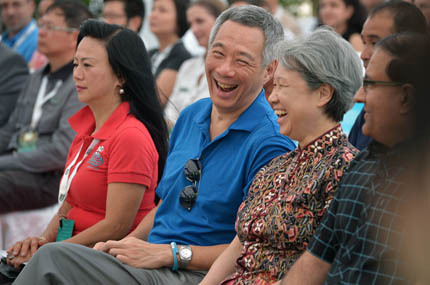 With Prime Minister Lee are his wife, Ho Ching (on PM Lee's left), Minister in the Prime Minister's Office S Iswaran (behind PM Lee) and WRS Chairperson Ms Claire Chiang (on Mr Iswaran's left). Home to a "United Nations" of animals, the River Safari is Asia's first and only river-themed wildlife park. 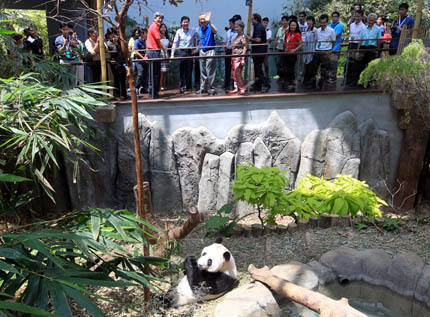 PM Lee (in blue) visits Giant Panda Kai Kai at the Giant Panda Forest. The 483 metre-long Amazon River Quest boat ride is designed to simulate an open-top boat voyage down the Amazon River. The 12 to 15 minute-long ride allows visitors to come face-to-face with close to 30 animal species living on the edges of the Amazon River. Visitors will get to see the red-backed bearded saki monkey, collared peccary, and red howler monkey. The Amazon River Quest is part of the park's Wild Amazonia zone which showcases the rich biodiversity in the Amazon basin. 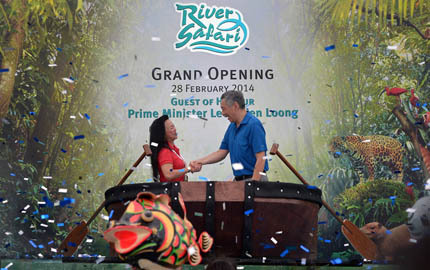 PM Lee and Wildlife Reserves Singapore chairman Ms Claire Chiang launched the official opening of River Safari. 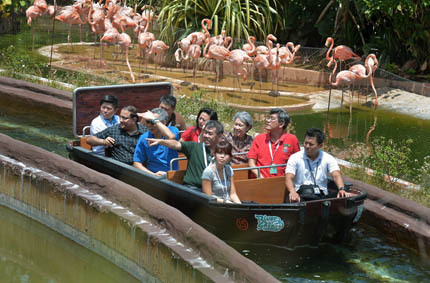 Since its soft opening in April last year, the River Safari has received more than 1.1 million visitors from all over the world. 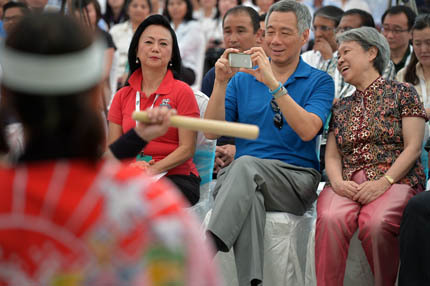 PM Lee and his wife Ho Ching enjoy the opening performance before the official launch. In a speech, PM Lee said that Singapore needs to enhance its tourism sector to continually refresh its attractions and events. Mr Lee said that travellers are becoming increasingly spoilt for choice, and companies must provide more interesting and varied options to meet the needs of more discerning travellers. "Workers must deliver higher quality service to meet higher expectations," he added.